From Ecuador’s southwestern highlands, ornithologists have described a new species of hummingbird, named blue-throated hillstar after its glittering ultramarine-blue chin and throat feathers. The blue-throated hillstar prefers grasslands on the Ecuadoran Andes, which is being rapidly lost to human activity, and researchers think the bird is likely already critically endangered. 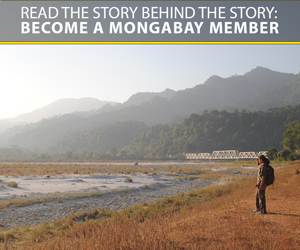 The researchers are now working with the local communities to protect the bird and its habitat. 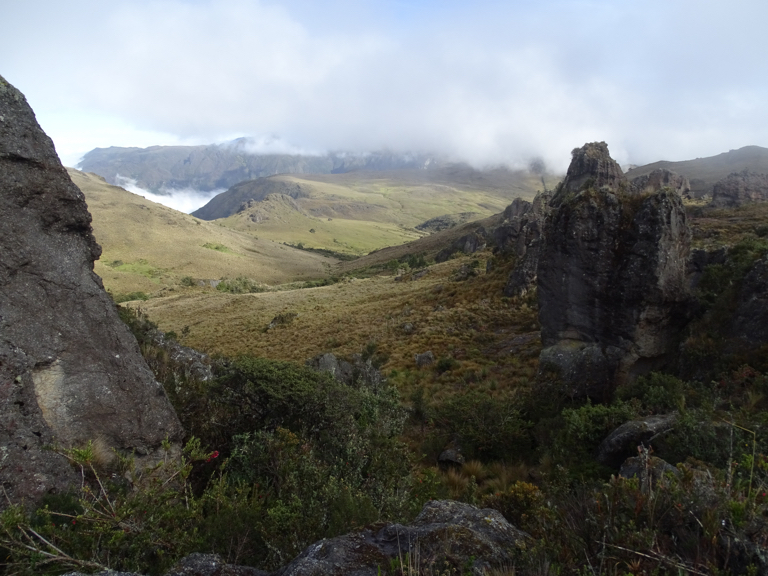 Franciso Sornoza, an ornithologist at the National Institute of Biodiversity in Quito, Ecuador, was hiking in the country’s southwestern highlands when a small bird caught his eye. It was perched on a branch of an uva camarona (Macleania rupestris), a leafy shrub laden with red fruit, and looked like a hummingbird. But it gave Sornoza pause: he didn’t know of a hummingbird species that lived in the habitat he was passing through. A look through his binoculars, however, proved him wrong, and he was able to capture a photo of what was certainly a hummingbird, albeit facing away from him. He sent the photo to colleagues, but the angle left them unable to identify the mystery bird. Sornoza later returned to the same location and captured several photos of what turned out to be a unique hummingbird with a patch of brilliant ultramarine blue at its throat. “We soon realized it was something new, something we could not assign to any known species,” said Juan Freile, an ornithologist at the University of San Francisco in Quito. Franciso Sornoza first saw the hummingbird while hiking through Ecuador’s southwestern highlands. Image courtesy of Francisco Sornoza. Just two weeks after Sornoza sent out his photos, he and Freile secured funds for an expedition to study the blue-throated hillstar and collect specimens. They were joined by other scientists to help collect genetic data and record the hummingbird’s calls. If the bird’s throat was distinctive, the sound that it made wasn’t. The blue-throated hillstar’s calls were very similar to those of the green-headed hillstar (Oreotrochilus stolzmanni), a closely related species of the same genus. The calls were so alike, in fact, that when Sornoza’s team played a recording of the green-headed hillstar, the blue-throated hillstar responded as if it had heard one of its own species call out. The real standout adaptation of the blue-throated hillstar is the unique coloration of its plumage. Sornoza’s team has hypothesized that in the Oreotrochilus genus, coloration evolves faster than vocal differences. As exciting as it was to discover and describe the new species of hummingbird, the ornithologists quickly realized that humans could very nearly have missed ever seeing it. 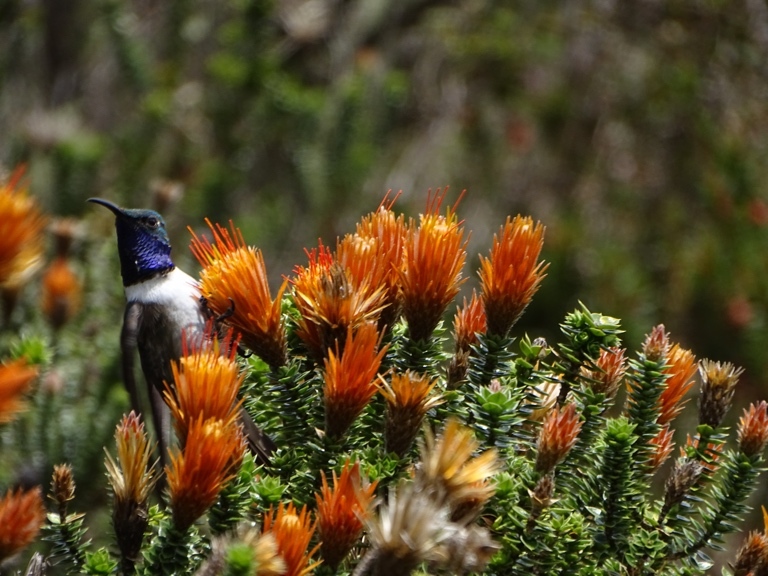 In surveying the blue-throated hillstar population, the team determined that the small but vibrant hummingbirds occupied an extremely restricted area, little more than 100 square kilometers (39 square miles) at most. 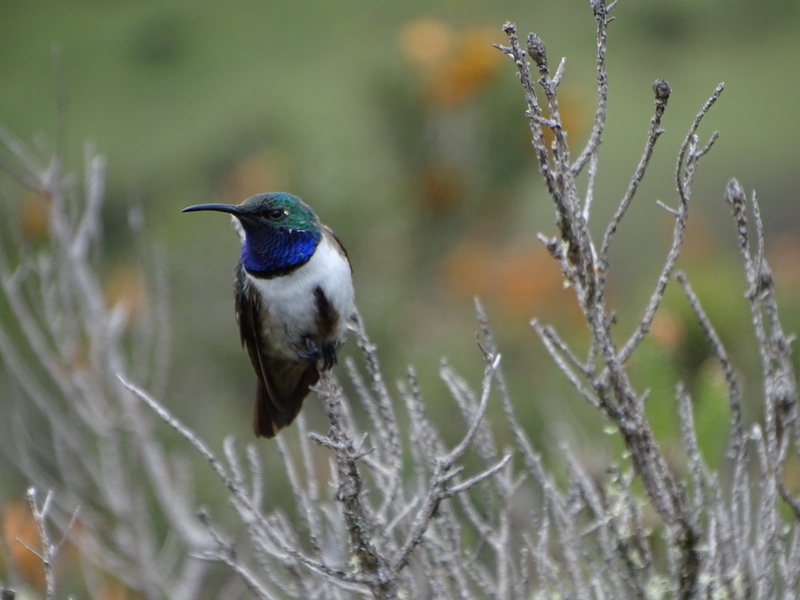 In addition, the habitat itself is unique: the blue-throated hillstar prefers grasslands with patches of shrubs in the high, treeless plateaus of the Ecuadoran Andes known as paramos. But this habitat is being lost to human activity. Cattle and horses graze here extensively, reducing vegetation and shrubs like the ones where Sornoza spotted his first blue-throated hillstar. Other parts of the hillstar’s habitat are developed for farmland, pasture and pine plantations. The greatest threat comes from gold mining. Sornoza and his colleagues concluded, based on the IUCN standards for evaluating the conservation status of a species, that the blue-throated hillstar hummingbird is critically endangered — just a step away from being declared extinct in the wild. The blue-throated hillstar’s habitat is fast disappearing. Image courtesy of Francisco Sornoza. With this dire threat assessment in mind, Sornoza’s team had to make an important decision about their study. An integral part of the process of describing any new species is to collect a holotype — an individual that is preserved to define the morphology of the species. But the act of collecting a holotype is rife with ethical dilemmas when the species is already endangered. Yet many researchers believe that the description of a species, complete with a formal holotype, is the first step toward its conservation. The blue-throated hillstar team spent long hours determining how many specimens to collect without negatively impacting the endangered population. “Population size in these birds is basically limited by the number of females; we only took three females, which is usually the minimum required for describing population variation,” Bonaccorso said. The specimens taken from the wild were quickly succeeded within their territory by new hummingbirds. This was critical information for the researchers. “It seems that the major limitation for population growth — and resulting small population size — is availability of territories,” Freile said. The researchers say the collection of a handful of blue-throated hillstars is unlikely to have had a negative impact on the species, whose biggest threat is the loss of their habitat for agriculture and mining. With their holotypes secured, they then compared them with other hummingbird specimens at six different natural history museums in five countries to determine whether they what they had was indeed a new species. Knowing what they do about the blue-throated hillstar now, Sornoza and his team are determined to protect the species. He said the communities surrounding the newly described hummingbird’s range were proud to be associated with the unique species. A preserve is currently under development, and the team plans to train community members in bird tourism so they can become protectors of the species. Though still concerned about the blue-throated hillstar’s critical state and small population, the researchers hope a timely intervention can save the species. The blue-throated hillstar may already be critically endangered. Image courtesy of Francisco Sornoza.